Pesto was not really part of my life until I met Matthew. Sure, I’d eaten it before, here and there, but it was not on the list of food I consumed regularly. That all changed the first fall that we were dating. Matthew was gardening with his dad at a large community garden, and his dad had a BUMPER crop of basil. I’m talking huge trash bags full of the stuff. 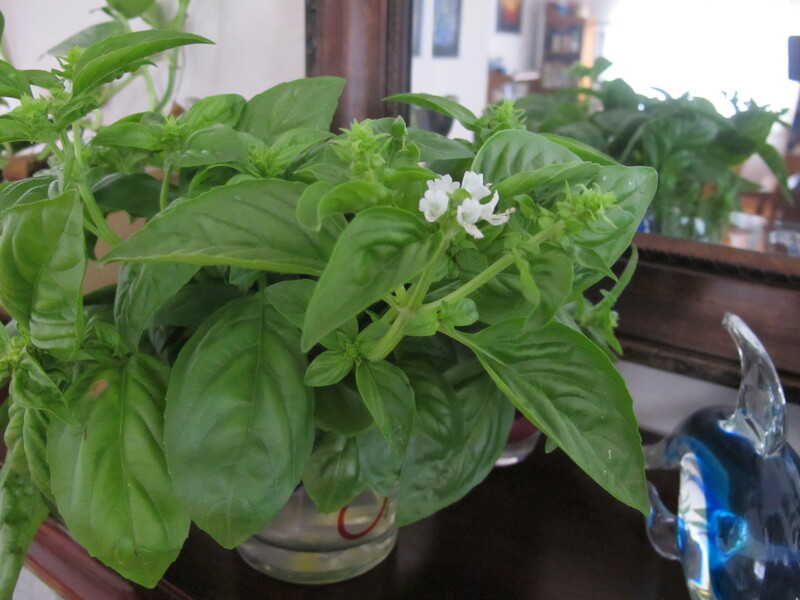 Anyway, back to the basil. Matthew is not a sports fan AT ALL, but he joined me on the couch most Saturday afternoons that fall (twue wuv), learning more about football than he ever wanted to know (and asking really cute questions). But he didn’t show up empty handed. On more than one Saturday, he arrived on the doorstep with one or two HUGE black garbage bags full of basil. His dad had harvested whole branches, and sometimes entire basil plants. Our mission was to pick off all of the leaves and freeze them. Our crazy stores of frozen basil meant we could make pesto all year long, and we did. Good pesto is not a cheap endeavor, even when you have your own basil (if you have to buy the basil, it gets even pricier). At some point in the game, I read about using walnuts in place of [uber-expensive] pine nuts, and we would alternate, making one batch with pine nuts, the next with walnuts. Our pesto recipe came from our go-to vegetarian cookbook, 1000 Vegetarian Recipes by Carol Gelles, and was pretty standard — basil leaves, pine nuts, olive oil, garlic, and salt, with some Parmesan cheese stirred in at the end (we usually just add the cheese when serving, and I often skip it altogether). I recently made some modifications to that traditional pesto recipe, with good results. Substituting some kale and arugula for the basil adds extra depth and a freshness that I love. I discovered that pepitas (pumpkin seeds) work equally as well as walnuts (it’s been months since I bought pine nuts!) There are a few methods for making pesto, but I prefer the blender. 1. Place about half of the greens (kale, arugula, and basil) in the blender. 2. Pour half of the oil over top, and start blending, adding more of the oil as needed. 3. Once you have the first part nicely blended, add the remaining ingredients and blend until smooth. You may need to turn off the blender and stir a bit, and perhaps add a bit more olive oil, depending on your blender. This makes a pretty large batch of pesto. Unless you’re feeding a lot of people, plan on freezing some. Many places suggest freezing pesto in ice cube trays. I use muffin pans for freezing slightly larger chunks. Once frozen, I put the pesto blocks in freezer bags.